Book direct from www.designholidaysfortevillage.co.uk Forte Village Sardinia website and get unbeatable rates at the Forte Village in Sardinia, we are so confident of this that we will offer a price promise that we will never be beaten on price! Our fantastic per person packages at the Forte Village in Sardinia also include Children’s Club. Due to our fabulous relationship with the Forte Village we are pleased to offer the best possible rates at the Il Borgo bungalows in Sardinia. Situated on a hillside at the Forte Village with magnificent panoramic ocean views, Il Borgo has reconstructed the look of the characteristic Sardinian seaside village, complete with a tiny town square. Each of the 35 spacious bungalows at Il Borgo have features which include a private bath with tub and shower, air conditioning, direct dial telephone, colour television with satellite channels, bar fridge, safe, patio or balcony. Some bungalows are adjoining but must be requested in advance. Upon request, cots can be provided. The accommodation at the Il Borgo Hotel is available in a choice of Superior Bungalows and Deluxe Bungalows. All feature a bathroom with shower (some have a bathtub), air conditioning, telephone, LCD TV, minibar and safe. Clients staying at Hotel Il Borgo may choose between 2 types of bungalow – Superior Room Bungalows and Deluxe Bungalows. New elegant decor. Large double bedroom with an internal sitting room area and sofa bed. Bathroom with separate shower and bath tub. Private patio and garden area. 2 adults + 1 child. 31m². Barbie™ themed child’s accommodation is available to buy as a package on request. Covering 20 to 30 sq m, these ground floor bungalows have a twin or double bedroom with an extra sofa bed and space for a cot if required. The room opens out onto a patio and the bathroom has a bath/shower. 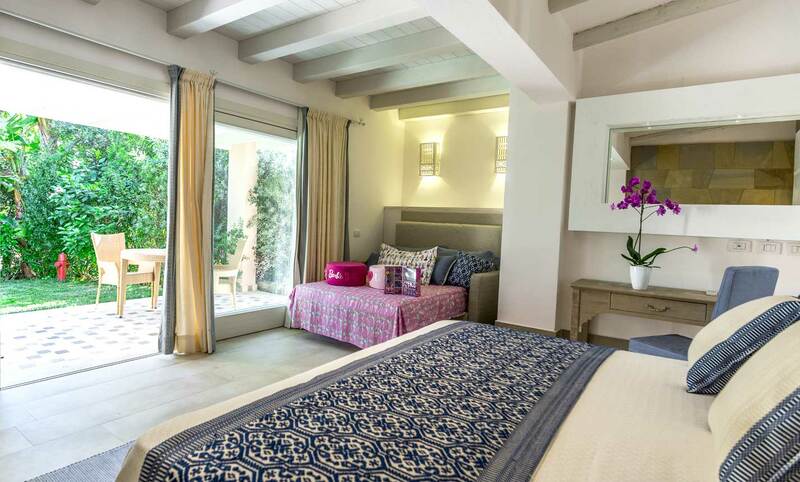 Some bungalows can be connected internally to create even more space for that perfect Forte Village family holiday. Il Borgo Hotel guests may choose to begin their day with breakfast at the Terrazza Oasis or at the waterfront Bellavista restaurant. To take advantage of the fabulous Il Borgo hotel half board , you can dine without a reservation at La Pineta ,Forte Grill and with a reservation at the Sardinian and Brazilian restaurants. Other typical restaurants are available upon reservation without a supplement, while some gourmet and a la carte restaurants require a reservation and a supplement. Our amazing per person packages start from £2270 for a one week stay, including half board accommodation. You may dine at La Pineta Forte Grill without a reservation and take advantage of our exceptional half board. Or you could enjoy fine food at the Sardinian and Brazilian restaurants in Il Borgo with a reservation. Meanwhile, you may have an early morning meal at the waterfront Bellavista restaurant or at the Terrazza Oasis. We haven’t left the children out as the Children’s Club was designed just for them. To enjoy a meal at some of our gourmet and a la carte restaurants, you may need to make a reservation with a surcharge. However, some of the other restaurants don’t require a surcharge with reservation. Il Borgo Village is about 49 minutes from the Cagliari Elmas Airport. From the airport, you’ll take Arrivi to Via dei Trasvolatori/SS391 for 3 minutes and 700 m. Next, you’ll join E25 to Strada Statale 195 Sulcitana in Capoterra for 20 minutes and 23.5 km. At the roundabout, you’ll take the 2nd exit and stay on Strada Statale 195 Sulcitana for 9 minutes and 10.4 km before you get to another roundabout and continue straight to stay on Strada Statale 195 Sulcitana for 13 minutes and 13.9 km. Lastly, you’ll take Viale delle Nereidi for 4 minutes and 800 meters to Forte Village Resort. You can get the best possible prices when you book directly from www.designholidaysfortevillage.co.uk or you may call (+ 44) 01444 87 22 14. The prices are ideal for you.